I've been working away in my woodshop for the past several weeks working on some new puzzles for spring! At the moment I'm in a woodworking phase (as opposed to a sewing phase), which may have something to do with the fact that it is actually warming up to a degree that I can actually head into my woodworking shop without the need for a wool sweater and winter jacket. Along with a butterfly , puppy and tropical fish , the newest puzzle in my collection is this pastel Easter bunny(available in pink , blue or yellow ) - great for ages +2. 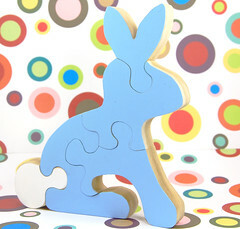 All puzzles are made from poplar - a fast-growing native hardwood; the perfect choice for childrens puzzles. The backs are kept natural and conditioned with a food-grade oil (to keep the wood hydrated). Fronts are painted with non-toxic paint, and sealed with non-toxic sealer for durability. I'm currently working on a "transportation" themed line that I hope to launch in the fall, motorcycles, trains, spaceships and helicopters. My son just turned 2 and "diggers" are just about his most favorite things in the world. What is it about diggers and little boys? Twice now I've been on holidays "ruined" for the adults by construction going on next door. Needless to say, for the little boys each time, it was the Best Vacation EVER! Your site is so inspiring. Thank you for sharing.